Compared to other gems and precious stones, pearls are particularly fragile. This means that an antique pearl ring needs a certain amount of delicate care in comparison with other kinds of jewellery. We’ve put together this brief guide for all you pearl-lovers, so that you can ensure your natural, cultured, or freshwater pearl can be cleaned and cared for properly, avoiding damage. Marine pearls can be easily cleaned by placing them in a jar of potato flour and then gently shaking it. Do not shake the jar too vigorously as this will damage the pearls. You should gently shake the jar for around two minutes followed by leaving it to rest for a day, shaking again the next day, leaving another day, and then shaking for a third and final time. Brush off the flour with a soft cloth. This process should restore the pearls. Otherwise, you can clean your pearl ring regularly by simply wiping it with a damp cloth, or cotton buds. It will look so refined and will be back to its former glory. You don’t need to buy special jewellery cleaner to care for pearls. Never steam-clean pearls or use an ultrasonic cleanser. Avoid exposing the pearls to acids and powerful chemicals. The best way to store pearls is to not allow them to touch each other. So, don’t allow your pearl ring to come into contact with another pearl. You should also avoid the pearl ring from being rubbed against a hard surface. Use a padded liner and keep your pearls separate from other jewellery when storing them. Avoid allowing pearls to rub against harder jewellery, such as diamonds or rubies, as this will cause damage. After buying your pearl ring from https://www.kalmarantiques.com.au/ or any other jewellery stores, you should wrap it in linen, soft cloth, or a satin-lined box. You should never leave pearls in direct sunlight or expose them to high temperature. The atmosphere for storing pearls should be cool with plenty of moisture. Pearls must also be stored in an atmosphere with some moisture. So, if the environment where the pearl ring is being kept is extremely dry, place a glass of water or a damp cloth next to the pearl to allow for moisture to get into the atmosphere. If the environment is too dry, the pearl may crack. Pearls also need some oxygen too. This means that you shouldn’t keep your pearl ring in a plastic container or plastic bag. If you have been keeping your pearl ring in storage for a lengthy period, then it would be good to get it out for a while in order to allow it to ‘breathe’, even if you don’t intend on wearing it. Jewellery is, after all, designed to be worn, and this is especially true for pearls. Natural oils from our skin help keep pearls healthy. However, always take care to remove your pearl ring when swimming or taking a shower. As a rule of thumb, pearls should always be the last thing you put on before leaving the house, and the first thing you take off when you return. A pearl ring is an indicator of immemorial elegance, so it would be a pity for it to deteriorate before it has reached the end of its lifespan. 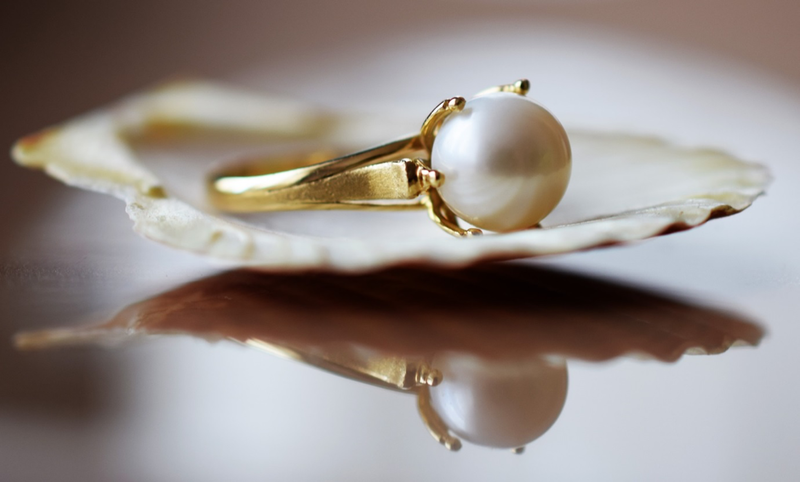 Follow some of these tips on caring for your pearl ring to make it last longer. If you clean your pearls well, store them properly, and then wear the ring whenever possible, you’re bound to give your pearls a long life.